CDCoop Commissioner, Ivelisse Torres-Rivera and Agriculture Secretary Carlos Flores-Ortega sign the agreement, as a group of farmers looks on. CDCoop Commissioner Ivelisse Torres-Rivera and Agriculture Secretary Carlos Flores-Ortega sign the agreement, as a group of farmers looks on. The Cooperative Development Commission (CDCoop) and the Agriculture Department (DA) signed a collaborative agreement Tuesday to promote the cooperative model through the development of agricultural enterprises and the creation of youth agricultural programs. 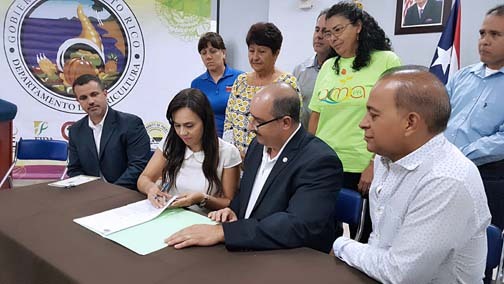 During the signing of the agreement in Las Piedras, CDCoop Commissioner, Ivelisse Torres-Rivera, said global agricultural co-ops are of crucial importance in the food supply, job creation and economic capacity of their respective countries. She further stressed that in Puerto Rico, the co-op movement represents an important sector with a huge capacity and potential for social and economic development. “Through this model of collaborative production we can develop several initiatives through which contribute to the island’s economic recovery,” she said, noting the co-op movement is part of the current administration’s platform. This partnership allows the CDCoop to educate farmers in eight regions of the island, share technical resources with the Agriculture Department to train and guide the members of inmate co-ops and agricultural youth co-ops in non-specialized schools. Meanwhile, Agriculture Secretary Carlos Flores-Ortega said the development of “agroco-operatives” is one of the agency’s programmatic initiatives. Flores-Ortega said several joint orientation sessions for farmers are planned for several regions of the island. The next session will be on July 18. Hey Buddy!, I found this information for you: "CDCoop, Ag Dept. join to promote ‘agroco-operatives’". Here is the website link: https://newsismybusiness.com/cdcoop-promote-operatives/. Thank you.